Most of my clients have been burned by web developers and online marketers in the past. So I put this list together to help you make smarter decisions when hiring anyone to do your website, videos, SEO or online marketing. SEO has it's advantages, but most companies sell expensive packages that don't give you any real results. This happens for a few reasons. SEO companies might be using black-hat techniques that get you a lot of links, but also get you penalized by Google. Since results are difficult to measure, and actual work is almost never proven, some companies will take your money and do literally nothing for you. Even when SEO does work, it can take a very long time - especially if all you're doing is having a firm write nonsensical content and creating cheap inbound links. SEO is a long term strategy, and should NEVER be your primary method of marketing. Most people who sell themselves as web designers are just that, designers. Isn't that what you want? Yes. But you also need someone who understands the technology that the design is built on, and the thought process of the people who visit your website. Otherwise you end up with a nice looking website that doesn't actually sell your services, doesn't allow you to communicate with prospects, and doesn't get you listed in search engines and other directories. Your website will be like a luxury car without an engine. For the same reason as web designers, these people are one trick ponies. They might build you a web site, and it might have a couple of good technical features to it, but it won't look pretty. Freelancers, students, interns, or your brother's cousin's uncle's grandson. They usually get the job because they are cheap and they know how to turn on a computer. They might even know how to build a decent web site. But this is a recipe for disaster years or even just months down the line. Why are they cheap? Usually they a new to the business and under charge. They realize this when you start asking for small changes. No matter how nicely you ask, and no matter how obvious an eyesore on the page, they will resist you. Sometimes they won't even complete the site because they don't know how to fix these problems. That could mean you have a site online so embarrassing that you don't even want to show to anyone. Why? Because they don't get paid extra for those little changes. Not because you're not willing to pay them, but because they aren't willing to ask. Or because they got smart and asked for more money on another website that they are busy working on. This is just the beginning. I know many people who have hired me to build their website afterwards, only to find out that their amateur web developers have all the passwords to their domains - this means a lengthy process in dealing with registrars to try to recover the domain, especially if those developers are completely MIA. Targeting on Facebook and Google can be difficult for inexperienced marketers. Just turning on a campaign and setting a budget usually means that budget will be spent. But does that mean the right people are seeing it? If you are a DUI lawyer in Texas, does it make sense to advertise to people in Arkansas who have never been arrested? If you don't figure out your targeting, you will burn through your budget and never get a single client. Getting people to your web site is one thing. But does that get you clients? No. Your site needs to be engineered to convert a window shopper into a buyer. It's difficult to find a company who can do everything. So most people will hire one company to build their website, another for email, another to do SEO, another to run Facebook ads and yet another for Google ads. You end up with a bunch of components that aren't working optimally, and companies blaming each other when things go wrong. I'm sure you have experienced this, maybe with your phone company or internet provider blaming your hardware or the hardware manufacturer blaming the software. There are so many components to online marketing, that dividing them out among companies who are unable or unwilling to work with each other, is just a bad idea. Imagine you have a broken windshield. Do you get on Google and search for "mechanic"? Of course not. You search for "windshield repair". And when the results come up, do you click on "Full service mechanic" or "Fast windshield repair"? Too many lawyers build websites listing all the things they are capable of doing, instead of focusing in on a niche. It's fine to diversify, but you will get more clients if you are speaking to them and their problem directly. If you focus on more than one type of law, it's perfectly acceptable to put up a different website for each niche. When people get there, they will have more confidence that you can help them with their criminal charge or their IRS issues than with "any legal problem they might have". People want to solve their problems. The more specific your niche, the more they trust you know about their problem, and the better results you will get for them. 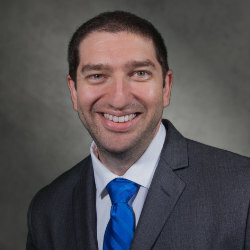 Dan Behrman is the founder of Top Local Marketing. He has worked in tech, video production and social media for over twenty years. In Top Local Marketing, Dan has put all his knowledge and experience to work by building an awesome team of content creators and online marketers to help small businesses compete at a higher level. To Learn more or to receive a free, custom analysis of your business, website, and online marketing strategy, please click here.